The museum Masséna, architectural jewel of the Promenade des Anglais, evokes, through its collections, the art and the history of the riviera from the attachment of Nice to France until the end of the Belle Epoque. All the works evoke this theme by a scenography that combines the graphic arts, furniture and objects of this period and more particularly history. Amongst others, Napoleon's death mask, made by Dr. Arnolt, Josephine's mother-of-pearl tiara, gold, pearls and colored stones donated by Murat to the Empress and the book written by the Prefect Liegeard are presented. It should be noted that the ground floor of the Villa itself is a work of art thanks to its sumptuous interior design by architects Hans-Georg Tersling and Aaron Messiah, and the furniture and works of art of the 1st Empire which garnish the salons. Villa Masséna was built on the Promenade des Anglais between 1898 and 1901 by the Danish architect Hans-Georg Tersling (1857-1920), one of the best architects of the French Riviera during the Belle Epoque. The style chosen is neoclassical with a strong Italianate stamp. The prince Victor of Essling (1836-1910) grandson of the Niçois André Masséna, makes it his residence of winter. His son, André, heir to the estate on the death of his father, donated it to the City of Nice in 1919, and the museum Masséna was inaugurated in 1921. 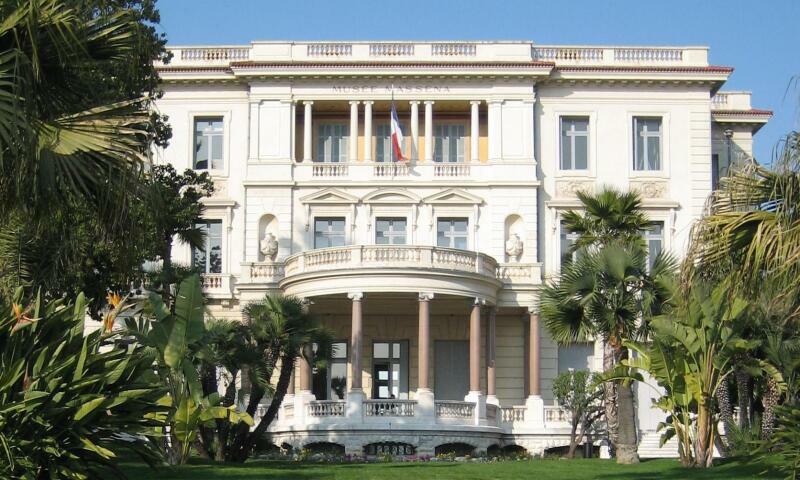 A vast renovation campaign, conducted by the city of Nice between 1999 and 2008, helped restore the Belle-Epoque villa, its interior decorations, and enhance its historical and artistic collections. The museum has a historic garden designed according to the design of a revolutionary landscape architect at the end of the nineteenth century and the beginning of the twentieth, namely, Edouard André overlooking the Promenade des Anglais and adjoining the famous hotel Negresco.